The vast majority of people, I’m beginning to realise, give kids far too much or far too little credit. Most children aren’t ultra-perceptive or wise beyond their years, and they’re not stupid or easily pleased either. If there’s any one adjective that can be applied to kids en masse, it’s ‘tasteless’. Which isn’t to say that they like everything. I’m just saying that, to a young child, there’s no essential difference between Space Chimps and Wall-E. It doesn’t matter that one was Time Magazine’s Film of the Year and the other had a character called Splork — they’re both just regular movies about colourful characters floating around in the sky. So the notion that children won’t ‘get’ Hugo, Martin Scorsese’s spectacular new 3D kids film, is ridiculous. Sure, they might be slightly nonplussed by some of the period detail, but just because the film’s A Little Bit Classy doesn’t mean kids won’t appreciate the big, loud, shiny spectacle of it all. And neither is it an indication that those who do are somehow child prodigies with superior critical faculties to their peers. It’s just an indication that kids are all different, like any other age group. As a legal adult (who pays taxes and everything! ), I liked Hugo a lot. It’s the sort of film that only Martin Scorsese could have made, because nobody else is allowed to be quite so extravagantly indulgent. After all, it is essentially a $150million public service announcement about the importance of the film preservation movement. Not so fast, stock photo lady! Because as $150million public service announcements about the importance of the film preservation movement go, this is one of the best. Its 2hr+ runtime could probably do with a bit of trim, but there’s so much sheer wonder in Scorsese’s first foray into children’s filmmaking that it’s hard not to share in the film’s all-encompassing passion for the art of cinema, and easy to forgive its plodding storyline and utter lack of conflict. Chloë Moretz’s British accent, on the other hand, is indefensible. 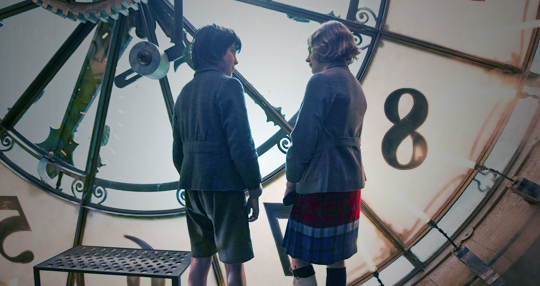 I still can’t imagine what audiences are going to make of Hugo when it finally reaches cinemas this Friday. Selling a kids film on the basis of it being from the same director as The Departed still strikes me as a weird marketing tack. But those who do choose it over Existential Dancing Penguins 2 will be hard pushed to muster much cynicism for a film so innately well-meaning.